Notes: The home-video edition of the series, now the definitive edition, contains several scenes in each episode which have been re-edited or redrawn. One morning in the not-too-distant future, Madoka Kaname awakes from a terrifying dream; all she can remember is seeing a strange, long-haired girl doing battle with a gargantuan monster in a wrecked and half-submerged city, and a white catlike creature who told her that she could become a magical heroine of great power, and thereby save this stranger's life and change the future. She shrugs off the nightmare, however, and quickly returns to the routine of her ordinary teenage schoolgirl life -- eating breakfast with her baby brother, house-husband father, and executive career-girl mother; walking to school with her friends Sayaka and Hitomi; meeting a new transfer student in her class who looks exactly like the girl from her dream... wait, what? The new girl, who bears the odd name of Homura Akemi, is an odd one -- remarkably competent at everything from sports to AP mathematics, but emotionally cold and distant... until she finds an excuse to be alone with Madoka and gives her a bizarre but urgent warning: Don't change who you are, or you will lose everything that you have. After school that day, our protagonist and her friends head to the mall; Hitomi leaves to keep an appointment, and Madoka and Sayaka are shopping by themselves when Madoka hears a voice in her head: the catlike creature from her dream, begging for her help. Going into a dark employees-only area, Madoka discovers the creature, apparently beaten half to death, and the person pursuing it -- Homura Akemi. Sayaka provides a distraction for Madoka to grab the little animal and escape from Homura, but together they find themselves walking into what seems to be a weird, creepy alternate reality, complete with surreal monsters that surround them chanting threats in German. 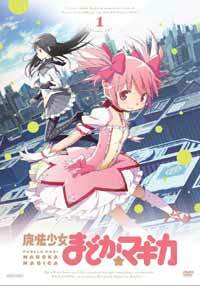 Madoka, Sayaka, and the catlike creature (known as Kyuubey) are saved by the appearance of upperclassman Mami Tomoe, who reveals herself to be a magical girl, bearing an item called a Soul Gem that allows her to transform. She dispatches the monsters with a massive array of supernatural muskets, heals Kyuubey's wounds, and faces down Homura when she too arrives on the scene. Kyuubey, now out of danger, announces to Madoka and Sayaka that he would like to make contracts with them to turn them into magical girls like Mami. The two of them hesitate, and he suggests they take time before making their decision; fighting against evil isn't the easiest thing in the world, after all -- especially for a teenage girl, when you think about it. But he does hang an enticing carrot-on-a-stick before them: Every girl who makes a contract also makes a wish, a single wish, and has it granted to the very letter. Whatever they ask, Kyuubey can give it to them. And all they have to do in return is battle against the Witches, the curse-born manifestations of hate and despair that secretly plague the world. That's not so much to ask, is it, Madoka? Especially when Kyuubey tells you that you yourself might become the greatest and most powerful magical girl of all time... For Madoka Kaname, who's indeed happy as she is but has always wondered if there's something more out there, this becomes the ultimate question -- the question that, one way or another, will decide her life. No further warnings are necessary, unless you don't want to know what you're walking into... so I'm going to come right out and say it: Madoka Magica, Studio SHAFT's first entirely original series, was created with the intention of doing to the stereotypical "magical girl" plot what Evangelion did to the stereotypical "giant mecha" plot. One really couldn't expect anything less from SHAFT resident director Akiyuki Shinbo -- whose other work includes Sayonara Zetsubou-sensei and the first season of the SF/fantasy/magical girl genre-buster Lyrical Nanoha -- and screenwriter Gen Urobuchi, who has contributed to such projects as Fate/zero and the infamously dark visual novel Saya no Uta (just to give you some idea of where he's coming from). It's worth noting that, given Urobuchi's reputation, SHAFT's original plan was to disguise his participation behind a pseudonym; the truth leaked a few months in advance, and Urobuchi promptly went on Twitter to do damage control by claiming that he was aspiring to change his genre and become what he called a "healing-type" writer. No one believed him, of course, and rightly so. Madoka Magica is designed, by its writer, by its director, and by its artists (chiefly character designer Ume Aoki, of Hidamari Sketch fame, and infamous visual conceptualists Gekidan Inu Curry), to draw viewers in with its both cute and fascinatingly weird imagery; once the show's plot and visual appeal get their hooks into you, they begin to tear at your heart as, bit by bit, the cute surface trappings of the magical-girl story fall away and the real truth comes out. It's a plan Urobuchi claims to have learned from fellow scenarist Yousuke Kuroda (Gundam 00, Trigun): the first episode places the viewers firmly in an unfamiliar world; the second begins to explain some of the rules of that world; and the third throws in a massive twist that takes both the audience and the characters by surprise and changes everything. The third-episode twist in Madoka Magica is indeed a game-changer; by the end of it, a valuable mentor is completely sidelined for most of the series, and Madoka is forced to an agonizing reappraisal of the question of making a contract. As befits such a deconstructive look at the magical-girl series, Madoka Magica asks us to consider the down side of the whole premise -- the idea that the safety, security, and even sanity of the world is meant to be preserved and protected by a bunch of teenage girls. Arguably the most emotionally insecure class of human beings on the face of the planet, given to extremes of euphoria and despair over the slightest change in their fortunes, and this Kyuubey character wants to recruit them to go out and fight evil? And he's going to give them a wish? People just don't know how to make wishes, especially not teenage girls -- Mami advises Madoka and Sayaka, very early on, that they would far better wish for something for themselves, rather than make a wish for another's sake; making a so-called "selfless" wish is in fact extremely hazardous, with unpleasant and unforeseen consequences almost totally guaranteed. Being a magical girl, too, is rife with unguessed dangers: your Soul Gem, the source of your power, grows dark and stained as you expend more and more magic, and can only be recharged by successfully killing Witches and using their Grief Seeds (the Witch equivalent of a Soul Gem) to absorb the stain; this, of course, means that it's rare for magical girls to work together, and more common for those close together to compete ruthlessly for the limited local supply of Grief Seeds, as demonstrated by the homeless renegade magical girl Kyouko Sakura. (You read that right: a homeless renegade magical girl. It's that kind of show.) And if your Soul Gem ever goes completely dark? God help you. The gap between the fluffy magical-girl dream, epitomized in the gleefully stereotypical opening credits, and the bitter reality is visually expressed by the eclectic design and animation of the series. Ume Aoki's cutesy characters fit in fairly well with the extravagant near-future architecture of their fictional hometown of Mitakihara, much of which is cribbed from designs that actually exist in our real world, but the protagonists are deliberately made to look awkward in the context of the nightmarish collages developed by Inu Curry and Shinbo to depict the alternate reality in which the Witches live... to say nothing of the horrific designs and animation of the Witches themselves and their surreal minions. What little information we have about the Witches themselves derives largely from sources outside the series (like the show's website, for example), but each Witch and her dreamworld -- a Barrier, as it's called in-universe -- are entirely different from the others, giving very subtle hints as to the personae upon which their monstrosities are built. Similarly, the heroines' magical-girl costumes, their choice of weapons, even the unique (and masterfully animated) quirks of their fighting styles, give clues to their personalities; one (Mami) is clad as an elegant sort of soldier, another (Homura) dresses in subtle and anonymous shades, yet another is a "white knight" complete with cape and swords, and one more carries a Cupid-like bow and arrow. Most of these personalities, however, are handicapped by the writing, which at times is either too subtle or too heavy-handed for such a character- and archetype-driven show; it's especially easy to view Madoka as a useless, cowardly, low-self-esteem doormat of a girl -- but there are moments where we see that she's no coward, that this kind of desperation is new to her and she knows there's something wrong with her attitude... Other such moments prevent us from reducing the other girls to typical mahou shoujo archetypes, one of the things this series seems to be warning against, but it's still arguable whether this is enough to rescue the characters from cliche. The saving grace is the voice acting, which is uniformly impressive among our protagonists. Lead actress Aoi Yuuki gives a particularly superb performance, taking Madoka Kaname from a regular genki girl to a terrified and uncertain victim of circumstance, paralyzed by doubt. Ai Nonaka's role as the independent, strong-willed, but vulnerable Kyouko Sakura gives her a wide range of emotions to act with. Eri Kitamura and Kaori Mizuhashi provide worthy support as the dangerously brash Sayaka Miki and the elegantly composed Mami Tomoe; Mizuhashi notably shines in a few isolated scenes that hint at the anguish and loneliness underlying Mami's confident exterior. Emiri Katou's contribution in the role of Kyuubey is also considerable; although he initially seems rather monotonously cheerful, Katou eventually manages to convey the relentless, strange rationality -- what one might call the alien logic -- that drives him. But the absolute standout of the cast, Yuuki's Madoka notwithstanding, has to be frequent Shinbo collaborator Chiwa Saitou as Homura Akemi, whose mask of cool aloofness and brutal indifference crumbles in spectacular fashion over the second half of the series, as we probe the depths of her history and begin to discover what tragedies (because there's always a tragedy, as Kyouko could tell you) caused Homura to don such a mask in the first place. One additional factor worth mentioning is the remarkable musical score, composed by modern Romanticist -- and pretender to the throne of Youko Kanno -- Yuki Kajiura. Her combination of classical, rock, world music, and electronic influences serves her well in helping to set the mood of the series, from cheerful pseudo-Celtic reels for lighter scenes to apocalyptic industrial/choral/orchestral pounding for moments of supreme terror; certain recurring musical themes, two of which are notably given to Kyuubey and Mami, tend to lodge quite firmly in the listener's ear. The theme which closes most episodes, Magia -- another Kajiura composition, performed by her regular collaborators Kalafina -- is also quite memorable, not least due to the fact that it also plays over the series' now-iconic first scene (Madoka's nightmare). Under the cover of a superficially cutesy Pretty Cure-like shell, Puella Magi Madoka Magica is an almost apocalyptically dark tale. It explores all of screenwriter Urobuchi's favorite themes: the dangerous depths of self-delusion, deals with the devil, the alarming gap that can exist between appearances and reality, the tragic tendency of human beings to jump to conclusions and miscommunicate and misunderstand, the inability to trust, and the ruthless march of all things -- energy, life, love, time, hope -- toward their inevitable end. And then it dares to ask the questions: From whence might hope come? Can the inevitable be defied? How could such a godforsaken situation possibly be salvaged? I can only offer you the assurance that the answers to these questions are not negative (this isn't Narutaru or Alien Nine, after all)... and warn you that they are bittersweet. Be prepared. What worries me the most about this review is the possibility that I've failed to express how utterly compelling this TV series is, for those who are drawn to it. Newcomers are often told by fans that if they find the first episode a little sluggish, they really should just stick with it through episodes three and four and then decide if they want to go on with it. Almost invariably, they choose to go on: get four episodes in, and your hand's already in the wringer; you have to know what happens next. I must emphasize that, for all its faults, it is still a story well told; Urobuchi's writing, Aoki and Inu Curry's design, and Shinbo's hand on the rudder made Madoka Magica into the absolute runaway hit of the Winter/Spring 2011 season, starting a cultural juggernaut in Japan that is still rolling along as I write, one year later (the show's merchandise is still selling at top speed; a veritable fountain of Madoka-inspired memes has poured out of both Japanese and Western fandoms; praise for the series has come from such illustrious names as Kazuo Koike and Hideaki Anno; there's even serious talk of a trilogy of feature-length animated films that retell and expand on the story a la Rebuild of Evangelion). Recommended Audience: NOT FOR KIDS. Despite the cute art style, the series is anything BUT child-friendly. In fact, it's incredibly violent at times, and the series is not afraid to let its cast die when the time arises. There's little to no fanservice, but the sheer violence alone makes this series unsuitable for children or young teens.